What’s on the agenda for the Georgia General Assembly this year? Plus, a list of state officers, legislators and the congressional delegation. This year’s legislative session represents a changing of the guard, with our first new governor in eight years, our first new lieutenant governor in 12 years and many new faces in both chambers. Planning for the 2020 budget will likely continue along the conservative path of former Gov. Nathan Deal, who established a decent rainy day fund in his term and budgeted for only modest increases in revenue. Gov. Brian Kemp will seek to help rural Georgia with tax breaks to encourage the expansion of high-speed internet across the state and incentives to help grow small businesses in rural areas. The ever-increasing cost of healthcare premiums along with Kemp’s pledge not to expand Medicaid means more workarounds, and state funding will have to be found to improve access to treatments and doctors in rural Georgia. In line with Kemp’s pledge, the legislative session could produce long-anticipated solutions for more rural broadband service. The Georgia Department of Transportation owns most highway and interstate rights of way, and a movement is afoot to utilize this resource and incentivize providers to close the gap between urban and rural service. Along with rural broadband access, many economic developers have education funding at the top of their wish lists. Despite fully funding the state’s Quality Basic Education formula in the 2019 budget for the first time in 17 years, Georgia still has a gap of $167 million in K-12 funding. And school transportation funding issues remain unresolved. Currently, the state covers about 15 percent of districts’ transportation costs. While the General Assembly added $930,000 to the transportation formula in last year’s legislative session and $15 million in bonds for bus replacement, school districts still bear the major cost burden of safely transporting students each day. School safety and election reform are likely to emerge as national scrutiny of our gun and election laws intensifies. Georgia’s $9-billion film industry could be at stake if the state passes a religious liberty bill. Certificate of Need (CON) regulations remain a bone of contention, and legislation to ease the rules will be considered. Supporters say the changes will bring Georgia in line with regulations in other states. Foster care reforms will continue as a result of funding approved in 2018, and anxious patients await the result of a joint study on access to medical marijuana (low-THC medical oil). Thankfully, new revenue will be coming in for parks and environmental conservation from the 2018 voter-approved Outdoor Stewardship Act. The Atlanta-region Transit Link Authority (ATL), a regional transit umbrella structure over multiple agencies created in 2018, will be a lot to chew on as MARTA shifts in leadership. The state could continue to expand transit in rural areas, may consider a train bank to help railroads increase capacity and could pony up more for Georgia Ports. The state’s new leadership will hit the ground running, with a lot of good work to do. It will be an interesting legislative session, to say the least, with broad-reaching impact. Georgia Trend’s Legislative Guide provides contact information for legislators and other elected officials. Koko Hunt photographed the capitol dome, and Ashley Sabol designed the Legislative Guide cover. A runoff to fill the late John Meadows’ District 5 State House seat will be held Feb. 5. A special election will be held Feb. 12 for the District 176 seat vacated by Jason Shaw, who became a Public Service Commissioner Jan. 1. Information that was not available at press time is indicated by NA. All other information in the guide was correct as we went to press but may have changed since. For updated information, go to legis.ga.gov. 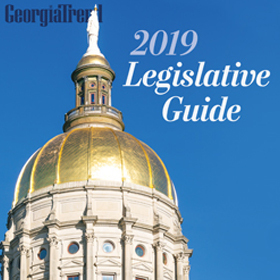 Click here to view the Georgia Trend 2019 Legislative Guide directory of state officers, state legislators and Georgia’s U.S. Congressional Delegation.